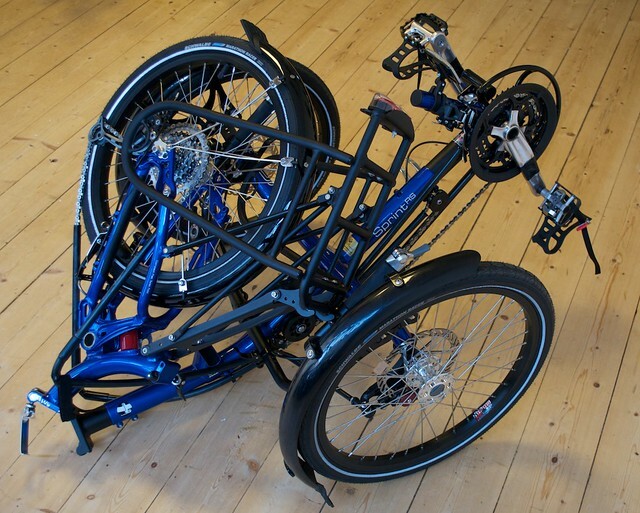 Is this folding recumbent trike the ideal all-rounder? With the Sprint, great design from start to finish delivers a fantastic fold, well balanced handling, a very comfortable seat over polymer suspension – but still provides the briskness you’d expect from a vehicle which excels at long journeys on the open road. While there are faster trikes (and more ‘adventurous’ ones 😉 ) the Sprint targets the middle ground, and ICE have delivered a great compromise. Variants include the 20″-wheeled, rear-suspended model (Sprint RS), a fully-suspended 20″ version (Sprint FS) or a rigid 20″ front, 26″ rear wheel version (Sprint 26), any of which may be fitted with an ‘X type’ swap out to race spec components. This demo bike is from Edinburgh’s Laid-Back-Bikes, where the range is one of the most popular sellers. This review covers the Sprint RS only, but of course a lot of it is applicable to the whole Sprint (or even whole ICE) range. 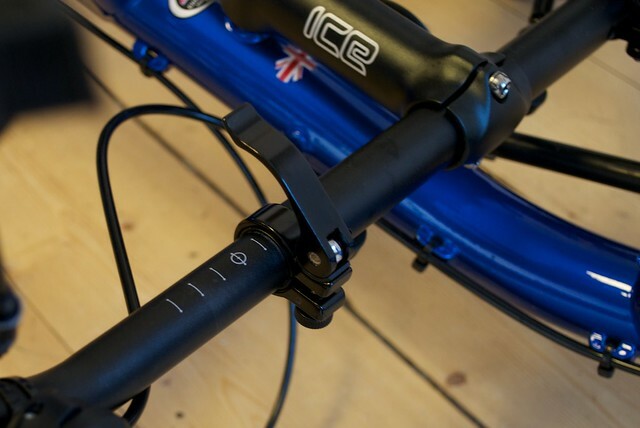 The handling of the ICE Sprint is exemplary – you can comfortably steer and brake with one hand, leaving the other free to use a camera, adjust clothing or gesture to fellow road users. I can’t recommend taking a test ride enough, as it will almost certainly sell you irrevocably on the idea of buying your own shiny ICE. 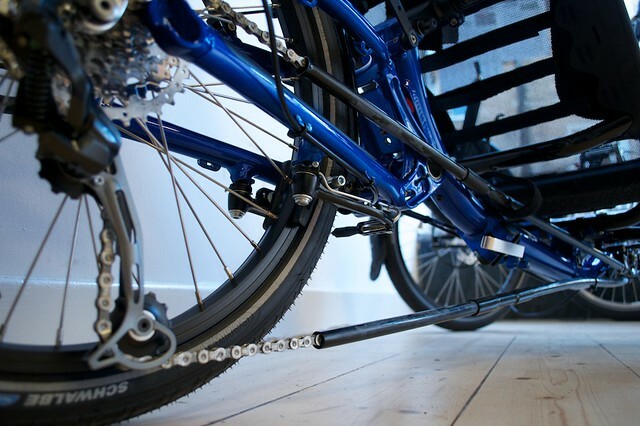 David Gardiner of Laid-back-bikes is an expert in the whole range and it’s well worth a visit, even if you have to make a bit of a trek to get up to sunny Edinburgh! 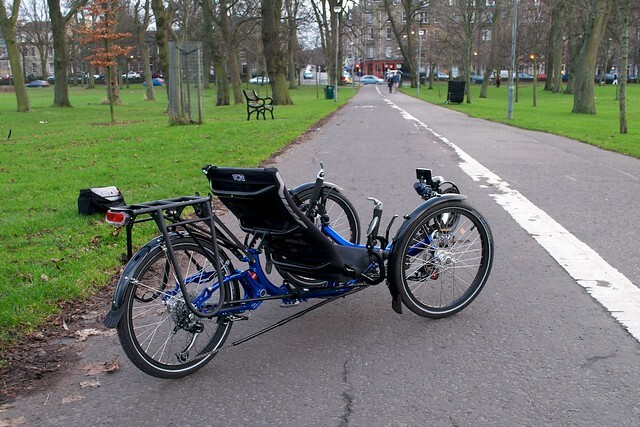 I’ve enjoyed a number of ICE trikes (not just the Sprint reviewed here) in a wide variety of contexts, from a 600km hilly audax through 200km to the mundane mission of getting through central Edinburgh’s rush hour to work. While traffic jams aren’t ideal (because the trike is just wide enough to make filtering awkward) there are very few situations they will not manage comfortably. Touring or relaxed day trips are where they naturally excel, both on tarmac and on unsealed surfaces. Unless you habitually take the Sprint off-road this is unlikely to be much of a problem in practice, fortunately. 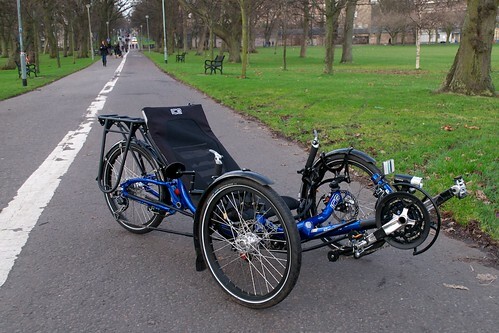 Pop the seat off altogether, loosen the handlebar QRs and the amazing ICE flat fold comes into play… the rear half of the frame pivots ninety degrees while folding to rest between the front wheels, making a surprisingly small package (it’s much easier to get into the car boot than a normal bike, and vastly easier than a two-wheeled recumbent). There’s no appreciable extra friction, interestingly, although you can certainly save yourself the weight, cost, and complexity if you’re going to be only regular rider. When it comes to adjusting the cockpit, the seat recline can be adjusted using a pivoting ‘ladder’ on the back of the seat, but this is limited to quite a short range of motion (37-44 degrees) so don’t expect much variation in the basic theme, which is “sit up and enjoy the scenery”. 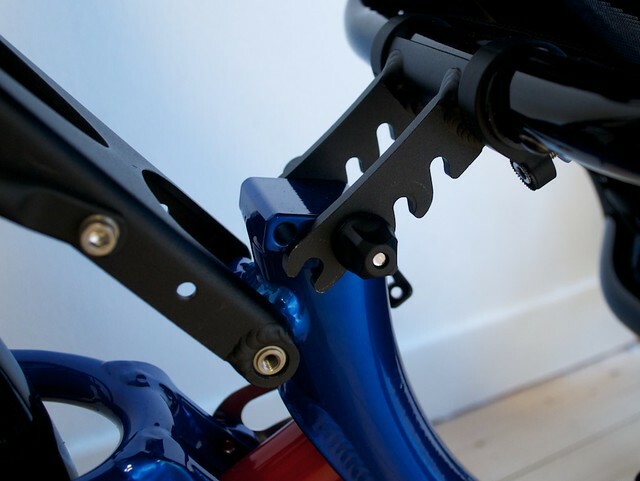 Also on quick-releases are the handlebars, which means you can adjust the width of the bars and their angle while riding (one also needs to be moved slightly to accommodate the fold). This is basically only constrained by the point at which your hands would otherwise hit the wheels in turns. This model features bar-end shifters as an (in my opinion worthwhile) upgrade over grip-shifts. Unfortunately on a trike, grip-shifts end up at the weaker pinkie-end of your hand, as opposed to being gripped by that handy opposable thumb! The bar-ends are ergonomically far superior and allow for a crisp, reliable shift every time. Excitingly, the Sprint 20RS in this side-by-side comparison section is a different example of the same model from an earlier review. As you can see, the higher and more upright seat of the Sprint allows a much more compact wheelbase. 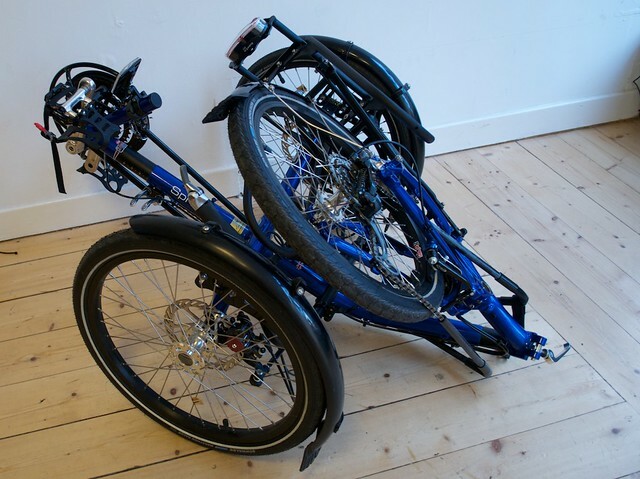 This has its advantages and disadvantages (a longer trike will be more stable, a shorter one more manouverable). The Sprint’s handlebars are higher and wider, and benefit from QR adjust, which is absent on the Vortex. It’s surprising how much you use the QR adjust despite careful initial setup, in my experience – precisely because it’s so convenient to trim. 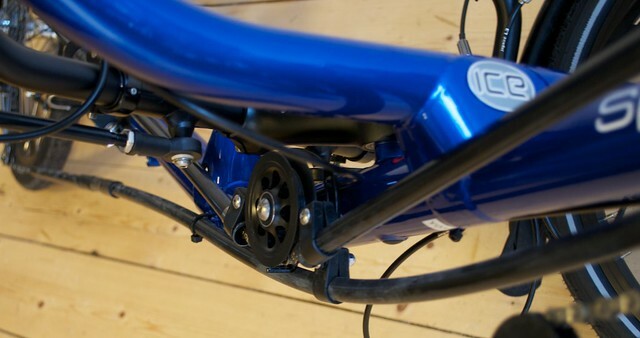 The bottom bracket on the Sprint is lower relative to the seat, giving a more relaxed, open feel. It’s also less likely to lead to pins and needles in the feet, and other ailments! All-weather capability and luggage capacity are two big points in the Sprint’s favour here: although you might be able to cram a little luggage on a Vortex and fit some kind of mudguard if you were so inclined, it would never be as competent an all-round trike. Ultimately the comfort factor with the Sprint is leagues ahead of the Vortex – in the same way that any tourer or audax bike will be more comfortable than a dedicated speed machine in the upright world, only much moreso. Add the ability to roll on fat tyres like Schwalbe’s Big Apple and the ICE Sprint RS is already off to a great start on the comfort stakes. However, with three tyre tracks to worry about instead of one, it’s much more difficult to avoid potholes than you’d expect, if you’re used to two-wheelers. This is where the polymer rear suspension really comes into play – I’ve found the simplest thing to do is just steer the front wheels around obstacles and let the third take care of itself, something that it will do admirably. Having a suspended rear end does complicate the fitting of a rack (nothing standard here) but the difference in comfort between the Sprint RS and a ‘racing’ trike is vast. Obviously they’re designed with different purposes in mind, but there’s no way you will get off the Sprint with bruises, as I did after a rough ride on the Vortex! At 16.5kg (or more depending on options), which is the best part of 40lbs, you’ll feel one of the key differentiators between the Spring and the Vortex every time you pick it up. It’s easy to fixate on weight because it’s easy to measure and compare, but really means very little for everyone reading this article (none of you being competitive hill climbers). The bike handles nicely on the road and the speed you’ll enjoy largely belies the weight in my opinion. 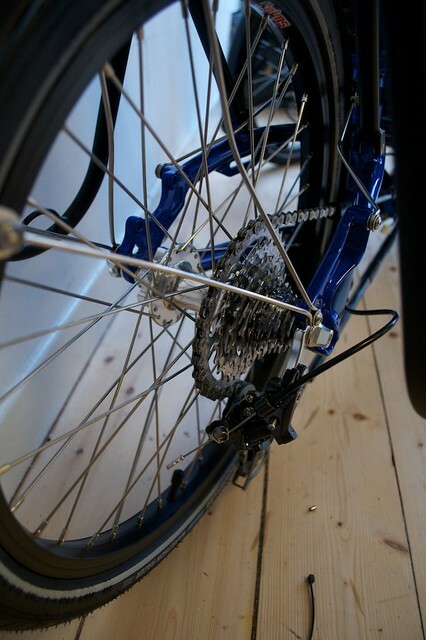 A triple chainset is fitted up front, with a SRAM X7 mech on this model. Altogether the gearing is a healthy 15.7-103.5″ (at 60rpm, that gives a bottom speed of around 2.5mph, while 100rpm in top gear is good for 30mph). The chain is routed using tubes and just one idler on the power side. 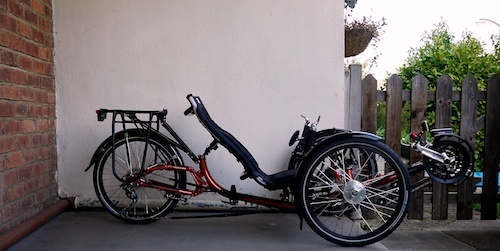 I’ve never seen measured power figures from a trike like this but while it’s noticeably slower than a fast two-wheeler, a test ride will immediately reassure you that the ICE Sprint feels like a fun and reasonably efficient way of getting around. 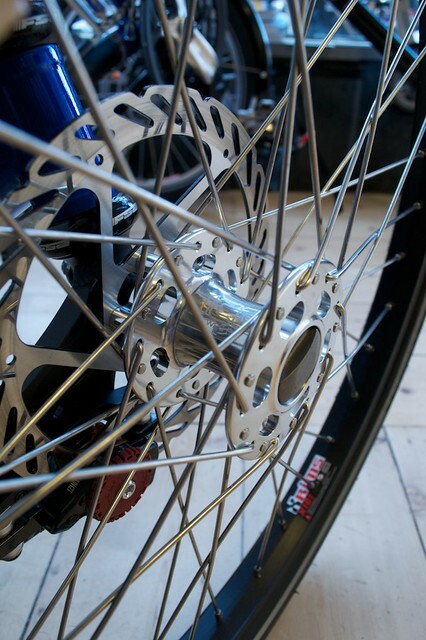 This model features the industry-standard BB7 disc brake on both front wheels, fitted to custom ICE hubs. The brakes are sharp and brake steer isn’t a significant issue- while you’ll want to brake with both hands by and large, you can certainly use one while you’re doing something else without swerving into a hedge! A v-brake parking brake is provided on the rear, controlled by a friction lever on the bars (at a push, I daresay you could use this as a drag brake). Some sort of mechanism to prevent the trike rolling off when left unattended is needed; either this or a strap of some kind to hold on one of the front brakes. 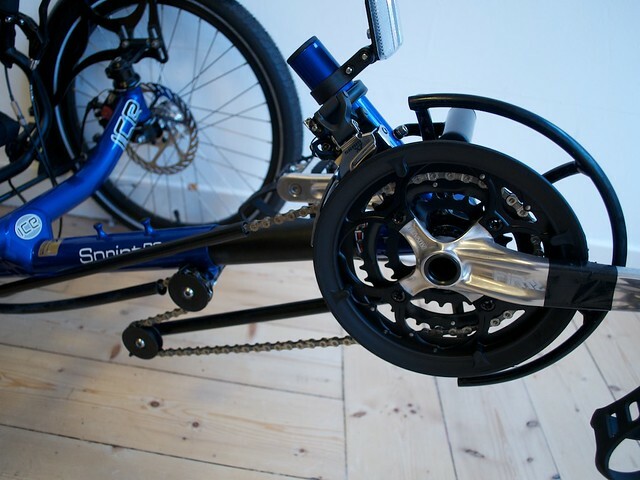 If you aren’t inclined towards the fashion for discs, you can also have the Sprint equipped with less expensive Sturmey Archer drums. These are extremely effective (especially on such small wheels) and completely maintenance-free. 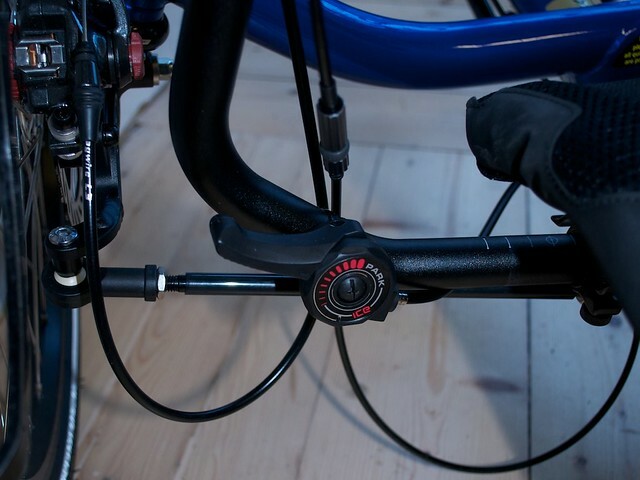 The lever feel is a little different, but nothing you won’t get used to – of my four current bikes, my commuter has a drum brake, two have rim brakes and one disc. The ICE QNT which I rode on the 600km Border Raid in 2010 had drum brakes, and it impressed on steep hills in wild stormy weather- something to consider. The Sprint comes fitted with sensibly high spoke count wheels, with rims which are wide enough to handle a balloon tyre like the Big Apple (you might go as narrow as a 28mm Durano if you really wanted to). This particular model is shod with Marathon Racers, which are a nice all-round option, with a thick enough cosmetic tread that you can expect high mileage and not too much puncture trouble. 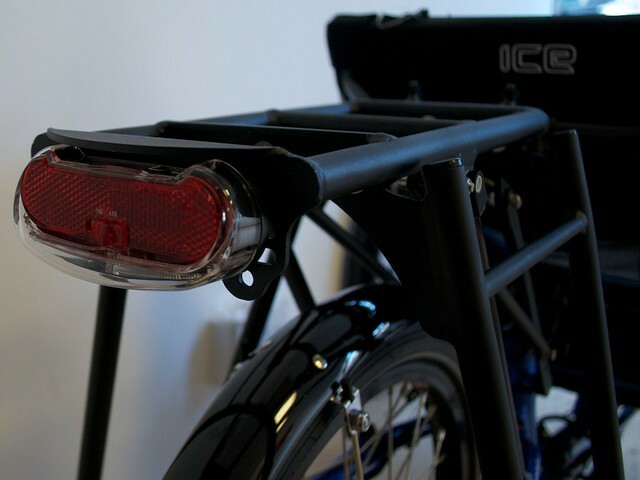 Nobody buys an ICE trike to save money – prices start around £2,000 but rise rapidly as you add essential accessories. However, these are excellent (perhaps even exceptional) vehicles which combine great design with a high quality of engineering. Add the exemplary handling to the fantastic flat fold and a wide range of well thought-out and well executed (if spendy) accessories and you have a convincing product offering. 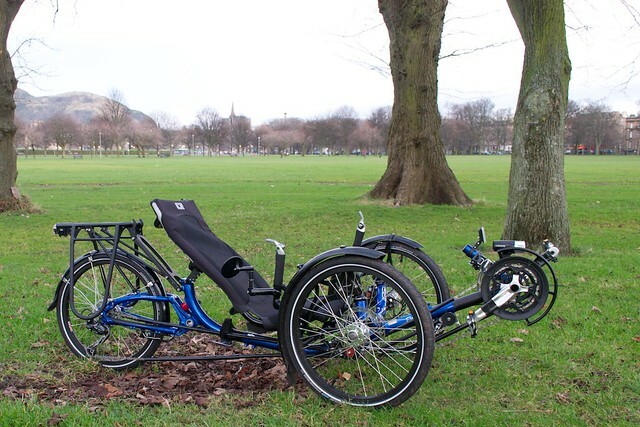 The Sprint 26 might be preferred to the Sprint 20RS in many ways – certainly there are significant advantages of the large-wheeled model – but at the end of the day this rear-suspended 20″ option is the reference tadpole trike implementation for good reason. 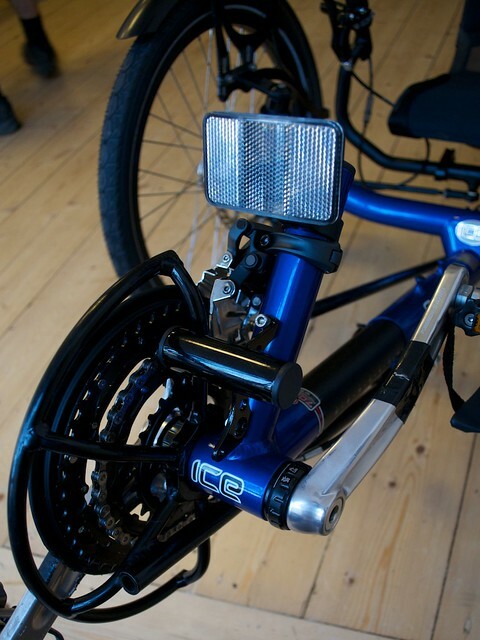 Try one at Laid-Back-Bikes now! 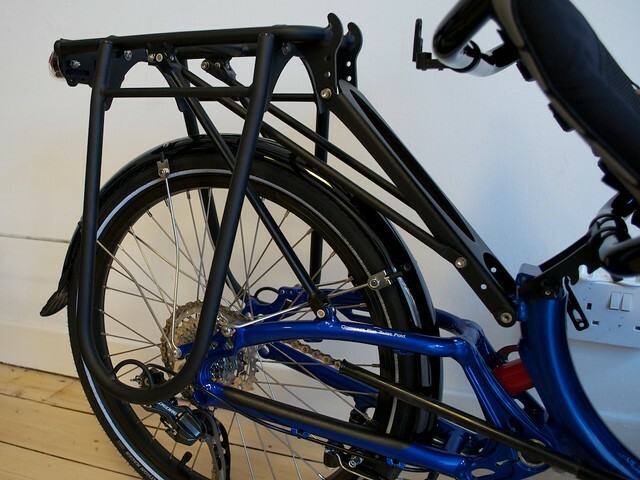 One major advantage of the 20″ rear end is that you only need one size of spare tube. That makes your puncture pack smaller, and easier to manage. As a highly satisfied owner of a Sprint 26, I have to say that the 559 rear wheel option would be my choice if buying again, if for no other reason than it looks nicer! In addition I find that the unsuspended Sprint handles high speed bumps on bends much more consistently that my former rear suspended ICE ‘S’ which tended to understeer rather a lot. In comparison with the ‘S’, I also find the mesh seat more comfortable (the individual strap adjustments help a lot, here). Thanks for the review. 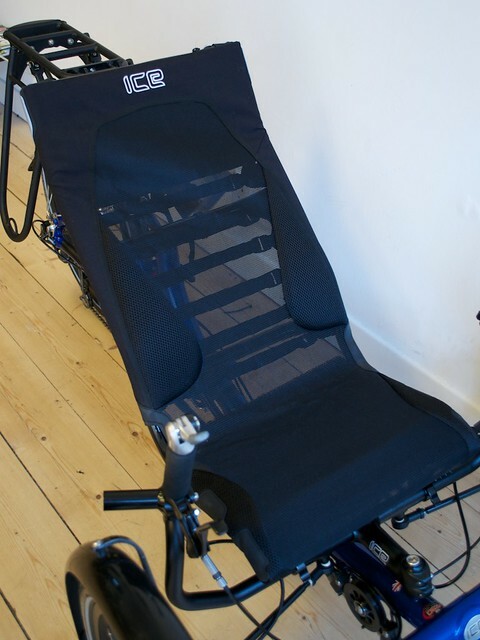 Great to see another review as they seem light on in the recumbent world. I am still tossing up between a ICE Sprint/Borealis combination or a Sinner Mango so this is a handy post. Excellent review of a versatile machine. Like Mike, I have a Sprint 26. After the cost of the rack is taken into account it is significantly cheaper. And it looks so good! Mine has an MTB Chainset and 12-36(!!) rear cassette. This overcomes the one disadvantage (other than suspension) of the 26 which is getting low enough gears for loaded touring. My lowest is 15.9″. After the last few weeks of wintry weather the trike has been superb in allowing me to ride unconcerned about ice and snow. I have an 06 ICE T with over 20k miles and still rides like the day I got it.. Excellent review and photographs! I, too, have had several ICE trikes over the past few years, from the S on to a 2013 Sprint fs, as well as a 2013 Vortex. I agree with you about the comfort of the suspension on the ICE trikes, and it makes the choice for what to use for touring a fairly easy one. Good review. A Sprint should really be red though, the blue makes it look like an Adventure! I opted for the Sprint 26 for various reasons including being able to use a standard reasonably priced mountain bike cassette (like the SRAM PG950 11-32 that’s fitted as standard), which seemed like a good idea when the trike will clock up the miles commuting in all weathers. hi, i enjoyed your article about the ice sprint. 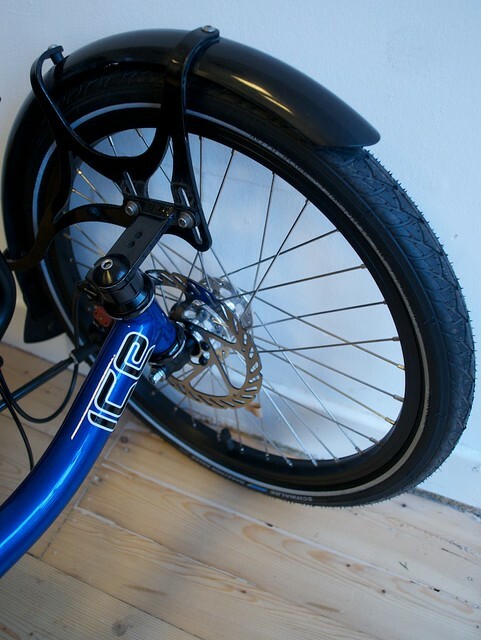 I have a fs ice sprint and would like to change the back wheel into 26 inch. Is that possible? 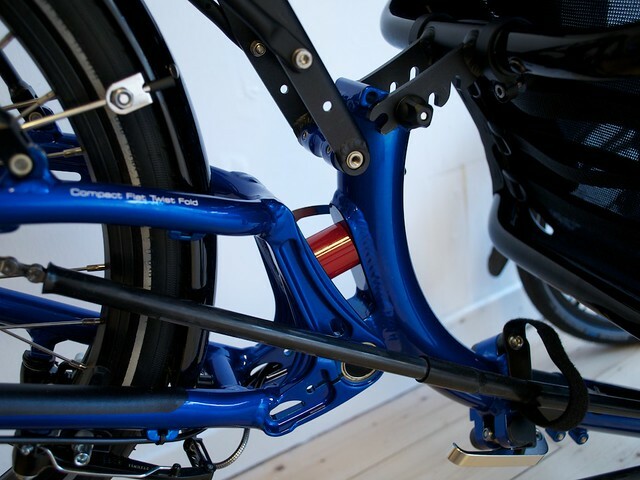 I also wan’t to place a electric bike support on my trike because of my dissability. Wich device is the best to use? I read about bion x is that un option? How do I manage that..? keep them rollin’girls and boys!!! 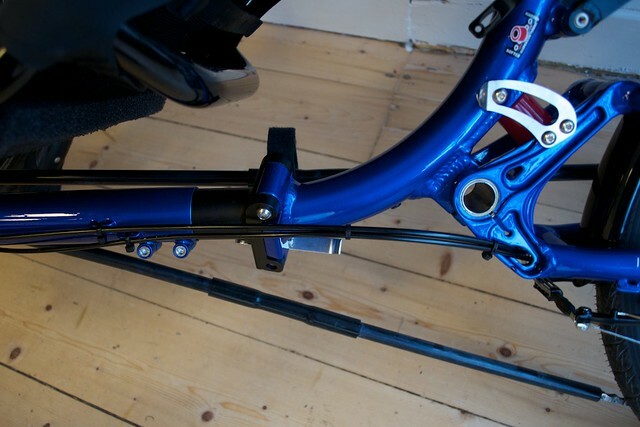 You can replace the rear end of your sprint with the rigid 26″ subframe (and you could put a Bionx on it). I don’t really know much about electric hubs though. Been toying with buying a recumbent trike for some time, and eventually found a local dealer here in South Wales. Ten minute test drive with an ICE Adventure and I was hooked… and eagerly awaiting my own hopefully at the end of the month. Obviously, I’m expecting difficulty with the hills around here (S Wales isn’t known as a flat place!) but we’ve got some pretty good cycle tracks and being a keen walker I pretty much know where to go and what too avoid. But, a couple of questions: do you know if these trikes will go through A-frames that I see dotted along the paths to stop motorcyclists. Also, any problems with using trains when transporting a trike? I’ve just come back from Lanzarote and saw these recumbents all over the place. As an avid tourer myself, I was really taken with them and got chatting to some Germans who were riding the ICE bikes. I would be interested in coming up to try them out but have to ask (for me) a vital question – where are they manufactured? You may know where I’m coming from, because although the cost is not prohibitive, I would like to think these are British or European made. Hey Barry, they are assembled in the UK as far as I know, but from parts which may be manufactured overseas. Certainly that’s true of the tyres, groupset and other parts, but also I suspect the frame components etc as well.